One of the most delicious things about trips to England is getting to taste (and bring home) their fabulous biscuits. I love ginger biscuits—the tang, the aroma, how well it goes with a cup of tea, and Bob loves chocolate. So when we saw these Deco women tins filled with our favorite biscuits, well, we couldn’t resist. Venetia is shown on a gold tin (6-1/2” X 9-1/2”) with light rays all around, and has more than 10 oz. of stem ginger biscuits. 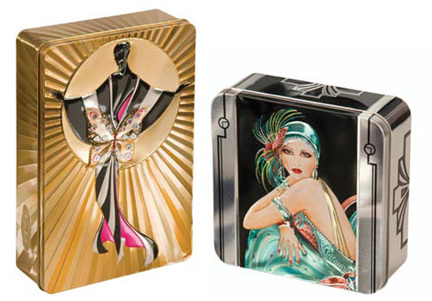 The silver tin with Deco details (6” X 6”) features Marlene in her feathered headdress and contains 7 oz. of Belgian chocolate biscuits. We’ve saved you the trip, so ENJOY and YUM!! !